SAY GOODBYE TO RESTLESS NIGHTS. Let us help you get more sleep. Is your toddler waking frequently? Have you tried lullaby music without success? Mums & Dads say ‘BEST baby Lullaby Music’! Nigh’ Nigh’ Sleepy Head is not like any other sleep system. Designed to enhance settling through attentive parenting technique, and music therapy, infants and toddlers learn relaxation to faster settling, less waking and deeper sleep. Lullabying, is so much more than an auditory experience. From bump to pre-school this music settling & sleep system enhances auditory (hearing) pathways, language development, mood, arousal, emotional and physical health. Even unborn babies feed and sleep better after birth! Toddlers can be a handful at sleep time and even wake more than a newborn! Sleep independence takes patience and a positive outlook. Using our Nigh’ Nigh’ Lullaby and Sleepy Head ‘TED’ toddlers love that he gives cuddles. Dress him into his pj’s and he becomes the perfect cuddle bear/pillow for all night comfort. TRIED MUSIC AND IT DIDN’T WORK? The best music is studio produced - not out of a toy which can irritate the mind. Is consistent in tempo and melody and repetition - for deeper relaxation. One lullaby song - Changing songs disrupts the relaxation process. Consistent melody and resting heart beat tempo - signal sleep time! 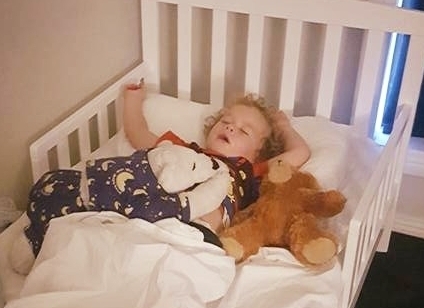 Nigh’ Nigh’ Sleepy Head lullaby and music is easy for you to sing, hum or rock to emotionally support your baby or toddler towards sleep independence. Lullaby is proven to synchronise your brain and your baby’s for a calmer state of mind! This sleep RESOURCE ends sleep time anxiety and makes it easy for your child to discover the art of relaxing into deep sleep. Nigh' Nigh' Sleepy Head lullaby sleep pack makes sleep easy! GET OUR instant DIGITAL NIGH’ NIGH' LULLABY DOWNLOAD! Thank you so much for creating a fantastic tool that is gentle, nurturing and respectful for our little ones. There is just so much pressure to leave our little ones to cry and it just isn’t right. When using Nigh’ Nigh’ Sleepy Head®, I know that Zac is falling asleep in a peaceful, calm and relaxed state. It's time for you to get more rest while your baby really sleeps like a baby! The essential pregnancy tool that will make parenting easy. Research shows babies that are exposed to a lullaby during the last two trimesters and first months can have less crying episodes, less episodes of colic, and reduced night waking. Avoid or Solve Sleep Problems! In the early months your baby will be adjusting to life. Nigh’ Nigh’ Sleepy Head® supports attentive attachment parenting for improved bonding, calming unsettled babies and decreasing parent anxiety. Feeling exhausted and baby unsettled? This is when establishment of a routine can be helpful. Developmental leaps and separation anxiety can disrupt sleep and lead to difficulty falling asleep and baby waking frequently. Most parents are prepared for sleep deprivation but when it goes on and on, it affects your physical and emotional health and every relationship you encounter. Sleep deprivation also has profound affects on you and your child, affecting physical and emotional health. Tired families are more stressed and less patient and don’t parent well. 40% of prep children suffer sleep regression - This can be completely avoided! Screen exposure is linked to delayed cognitive development and sleep problems. Low immunity, weight gain, behavioural issues, poor learning, anxiety and depression - Families need adequate sleep to be healthy! Sometimes chronic sleep issues require specialist help and a little 'tweaking'. Deb Herdman is a nurse health professional SLEEP EXPERT that has worked with many mothers using the ‘3R’s to Sleep Success’ system. She never advises stressful sleep methods. Once you have mastered Routine, Re-connection and Relaxation, you will find your child happy and relaxed about going to sleep. The end result is your child will become an independent sleeper that sleeps longer, deeper and no longer wakes repeatedly, overnight. No longer is sleep time a stressful event for myself and Jude. Thanks to Nigh’ Nigh’ Sleepy Head Jude falls to sleep relaxed and peaceful and only waking once a night for a feed. Deb you are a wonderful lady. I can’t thank you enough for all your support and encouragement. A bit of a backstory I attended one of Debs seminars at my wits end, stressed and sleep deprived. I had tried to let Jude cry it out, but that just left myself, my husband and Jude stressed out!